Registration is now open for the 2016 National Drone Show, an exciting conference and expo featuring red-hot Unmanned Aerial Vehicles (UAV) video capture technology. Produced by NewBay Media, with Stampede returning as the event’s Gold Sponsor, this year’s show also features the launch of the first D.C. Drone Film Festival and an Advanced UAV Workshop produced by education partners Future Media Concepts and Sundance Media Group (SMG). 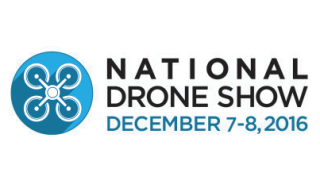 Held Dec. 7–8, 2016, in the Walter E. Washington Convention Center and co-located with NewBay Media’s Government Video Expo, the National Drone Show (NDS) will again bring together thousands of video professionals for two days of cutting-edge discussions and demos of the latest UAV and video capture systems, management and delivery technologies and techniques. Prominent keynote speakers include Lisa Ellman of the Commercial Drone Alliance. Find details at www.nationaldroneshow.com. Instructors from Unmanned Vehicle University, the only university in the world licensed to offer graduate degree programs in Unmanned Systems Engineering, will conduct free drone-operating demonstrations and educational sessions throughout the show in the Flying Cage, allowing attendees to experience firsthand the differing capabilities of various UAV technologies — such as DJI, AEE and XLY — and learn what products are best suited for their unique needs and requirements. The Advanced UAV Workshop is a day-long track of drone training sessions produced in conjunction with Future Media Concepts/SMG; it is designed for all organizations and professionals wishing to incorporate UAV into their production workflow and for all UAV and drone operators planning to become pilots for commercial use. Sessions include “Preparing for Your FAA Part 107 Test,” “Integrating UAV Into the Corporate/Commercial Environment,” “UAV Cinematography: A Recipe for Guaranteed Success,” “Identifying & Mitigating Risk in UAV Operation,” “Filters for UAV Cameras” and “A High-Level Overview of Current UAV Vehicles, Tools, Functions and Add-Ons.” Find the full schedule at www.nationaldroneshow.com/workshop. The D.C. Drone Film Festival will celebrate the visionary work of drone videographers from around the country. They’ll compete for cash and other prizes, and the winning entries will be screened at the show. “The show is the only such event to bring together thousands of video professionals from the Washington region’s government, military, law enforcement, enterprise, broadcast, cable, production and post production communities,” said Carmel King, Executive Vice President, NewBay Media’s Broadcast & Video Group. Invited exhibitors include drone manufacturers, drone accessory equipment companies and drone software and service providers.